HERNDON, VA--(Marketwired - Jun 5, 2013) - The U.S. Coast Guard took delivery of its 15th HC-144A Ocean Sentry maritime patrol aircraft from prime contractor EADS North America. The Ocean Sentry is based on the Airbus Military CN235 tactical airlifter, more than 230 of which are currently in operation by 29 countries. The latest aircraft delivered on-time and on-budget, will join a fleet of Ocean Sentries performing in a range of different roles from Coast Guard Air Stations in Cape Cod, Mass., Mobile, Ala., and Miami. With the ability to remain airborne for more than ten hours, the Ocean Sentry is performing a wide range of maritime patrol missions for the Coast Guard, including drug and migrant interdiction, disaster response, and search and rescue. "In today's tight budget environment, the U.S. Coast Guard needs programs that deliver what's been promised," said Sean O'Keefe, EADS North America Chairman and CEO. "EADS North America and Airbus Military are proud to be working with the USCG to field this capability consistently on schedule and on cost, and will continue to support this mission." 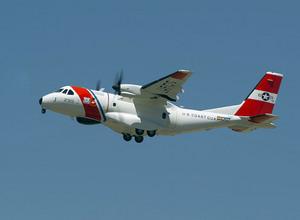 The United States Coast Guard operates fourteen HC-144A Ocean Sentry Maritime Patrol Aircraft and has three additional planes on order scheduled for delivery in 2013 and 2014. The Coast Guard plans for a fleet of 36 Ocean Sentries. The HC-144A achieved initial operational capability with the Coast Guard in 2008. EADS is a global leader in aerospace, defence and related services. In 2012, the Group -- comprising Airbus, Astrium, Cassidian and Eurocopter -- generated revenues of EUR 56.5 billion and employed a workforce of over 140,000. The U.S. Coast Guard took delivery of its 15th HC-144A Ocean Sentry maritime patrol aircraft from prime contractor EADS North America. The Ocean Sentry is based on the Airbus Military CN235 tactical airlifter, more than 230 of which are currently in operation by 29 countries.